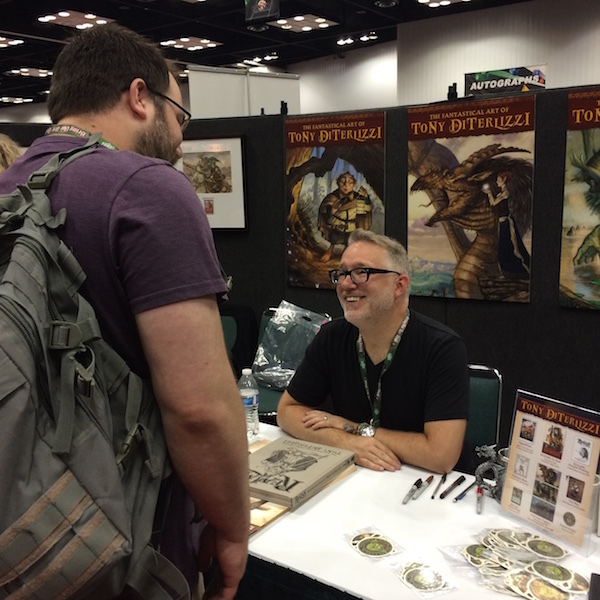 This time last week the Indiana Convention Center in Indianapolis was jammed full of 60,000+ gamers and I was happy to be among them. 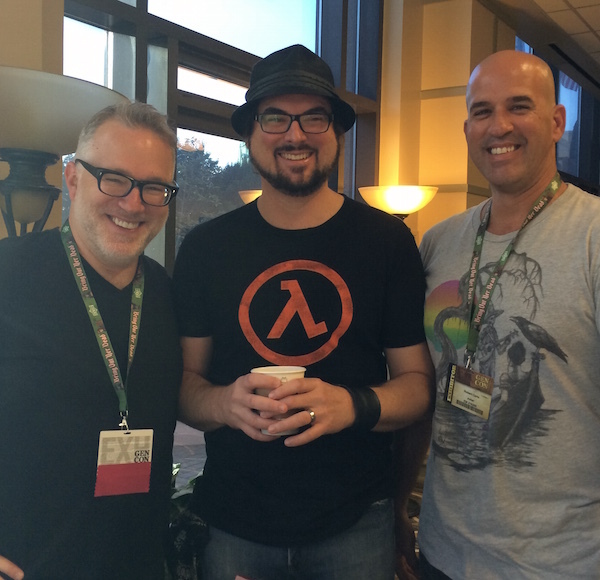 I haven’t attended “The Best Four days of Gaming” in over a decade and was delighted to see how it had grown in numbers of attendees and game companies. Our family loves to play board games and I was delighted that there were so many to choose from. (We’ve been playing Rumble in the Dungeon every day since our return home). 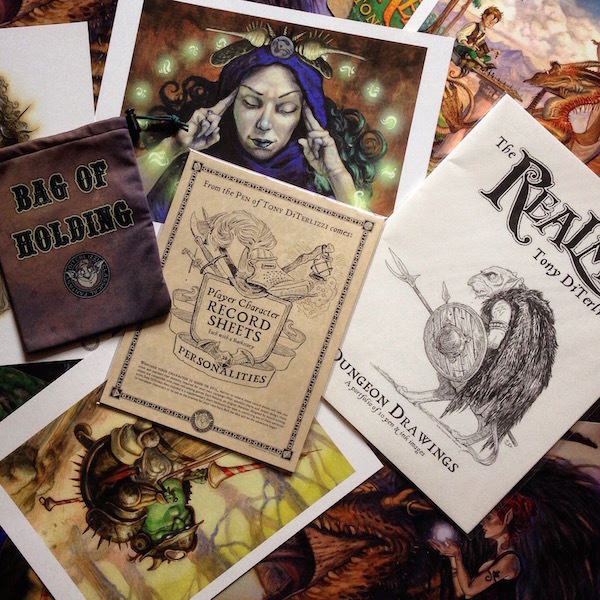 As I mentioned in an earlier post, I created all sorts of new gaming goodies to feature at my booth along with copious copies of REALMS. 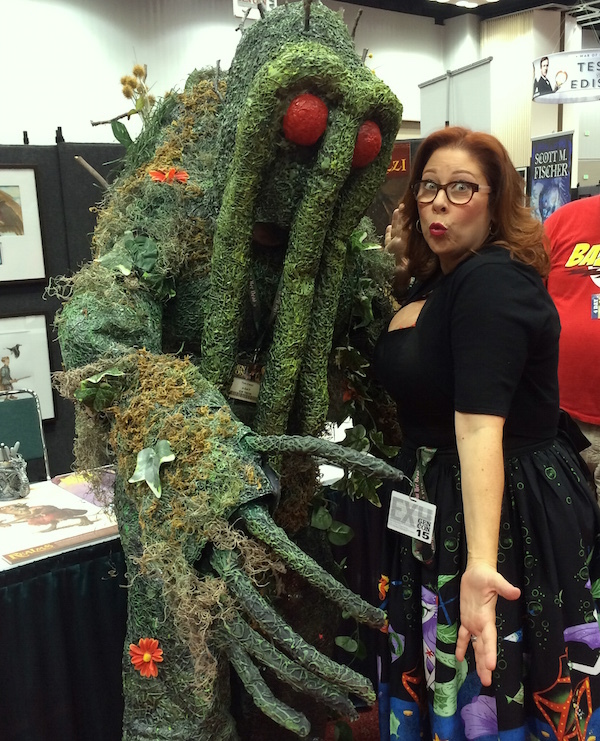 I was thrilled to reunite with old fans and meet new ones. 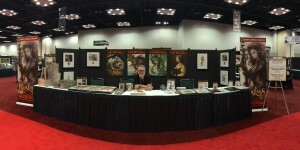 I drew and signed hundreds of books, prints and portfolios over the four days. 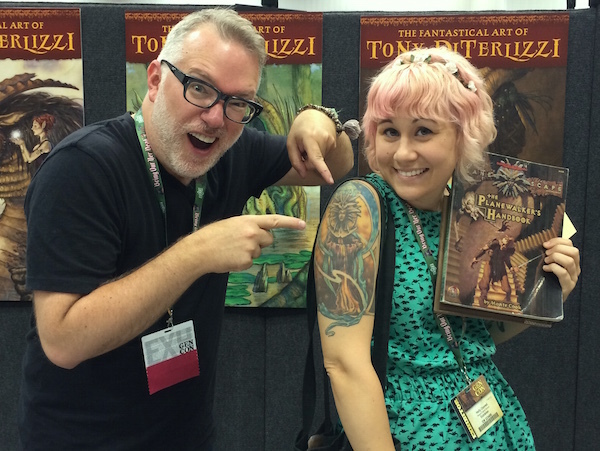 That’s me and Jim Ludwig (owner of Dark Sword Miniatures) geeking out over Jessica Rich’s painted samples of the “DiTerlizzi Masterworks” mini line, scheduled for release this fall. I can’t wait to game with these little guys! 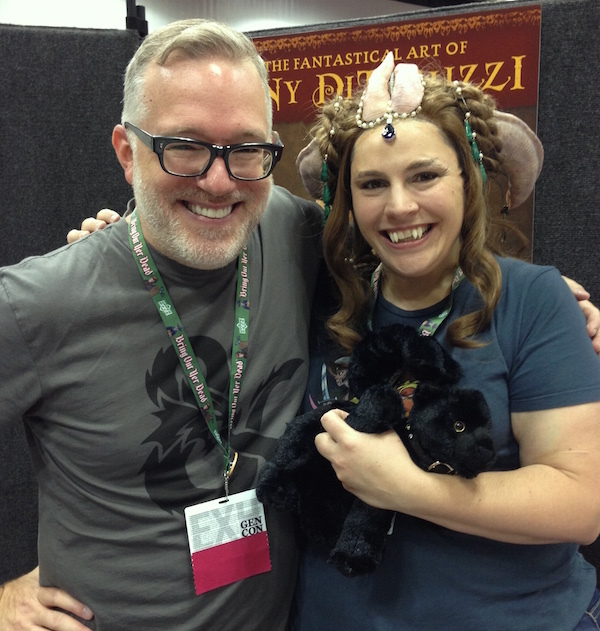 Cosplayer Clare came dressed as the “Portrait of a Young Tiefling” complete with pet Displacer Beast! The tag on his collar revealed his name as “Thaco”. A-M-A-Z-I-N-G. 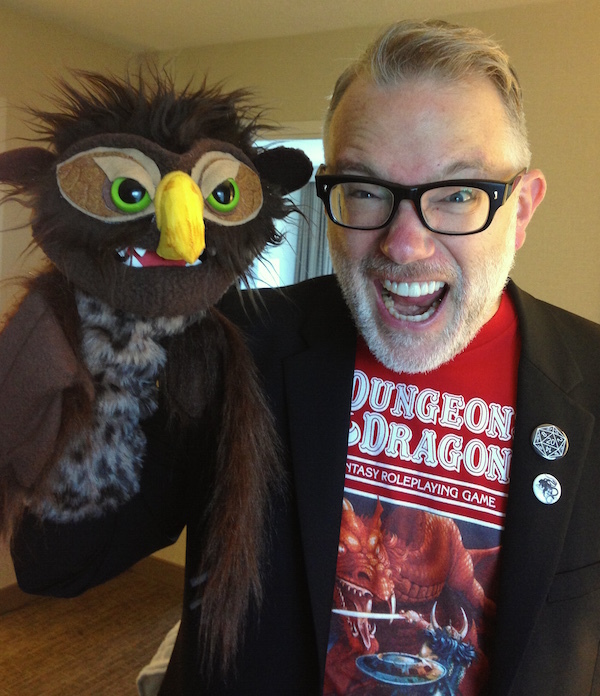 Speaking of cool stuffies, Angela purchased this Owlbear muppet for me from the folks at The Puppet Forge. It is two of my favorite things mashed together in one awesome ball of foam, fleece and fake fur. 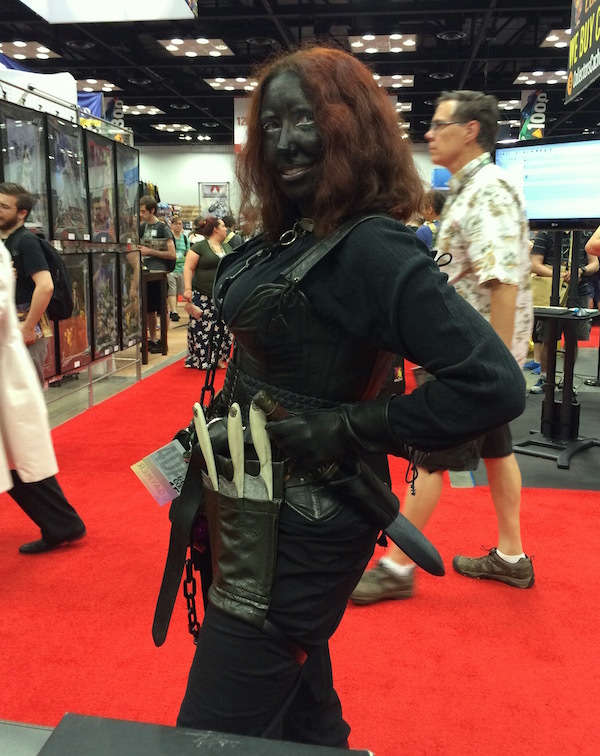 We had plenty of visitors at our booth, including this Drow Elf. 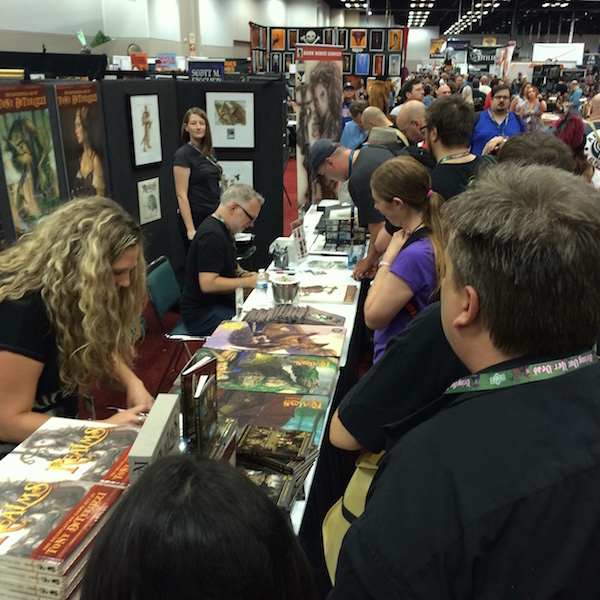 I had no idea my books were popular in the Underdark. While we are talking of monsters, this is Tim Beach. 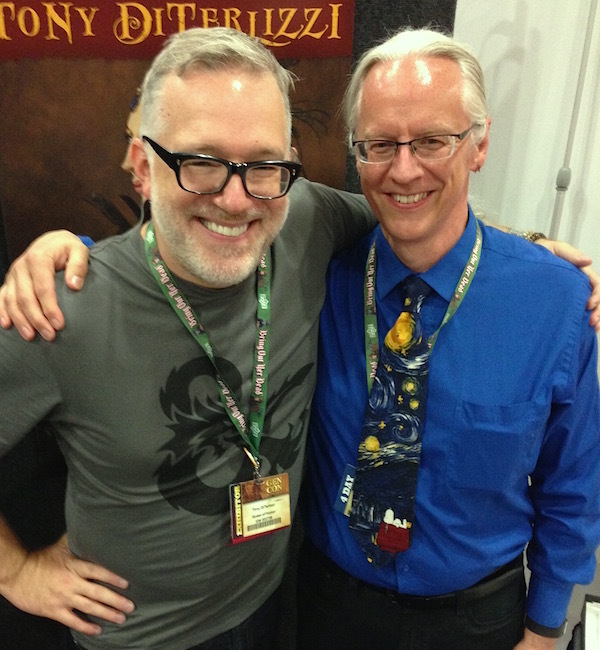 He was the Project Developer at TSR responsible for hiring me to work on the AD&D Monstrous Manual back in 1993: a book which certainly changed the course of my career as an illustrator. 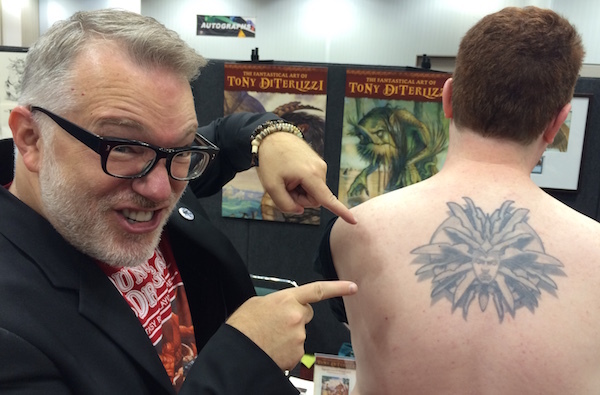 …and this is another person who changed my career. 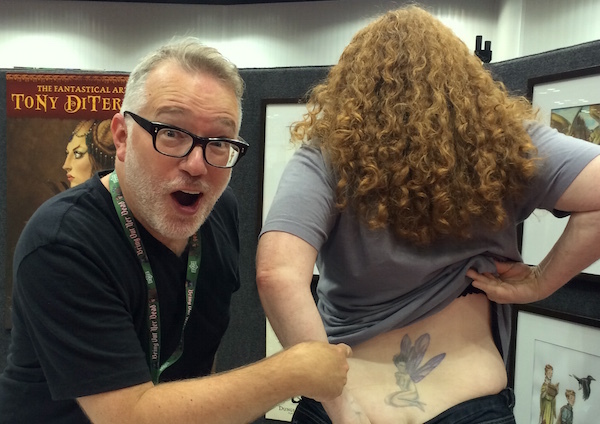 This is Peter Adkison, founder of Wizards of the Coast and publisher of the card game, Magic: the Gathering. 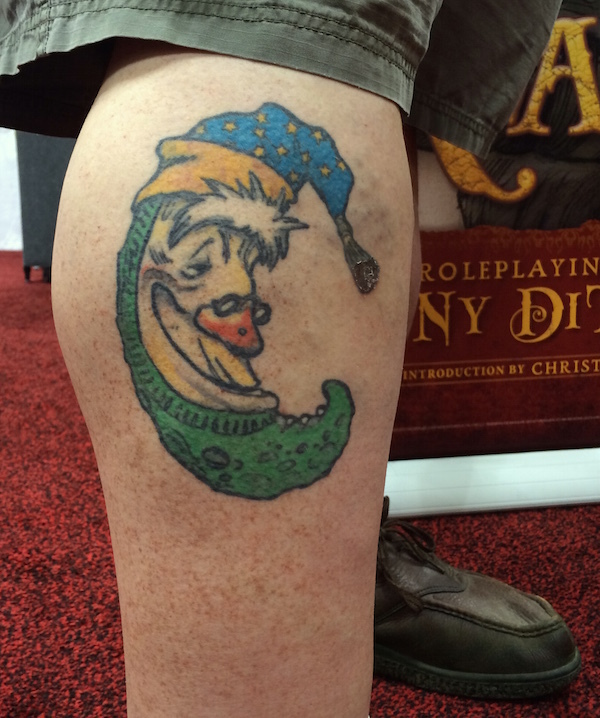 My favorite tat was displayed on another longtime DiTerlizzi fan, Randy, who has been rocking Mr. Moon (from Jimmy Zangwow) since the book was published in 2000! The fella on the right is Rob, whom I have known since 2nd grade. 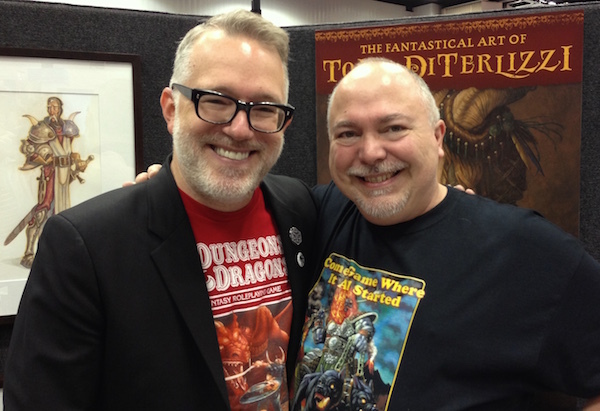 He loaned me his AD&D Monster Manual back in 1982 to copy pictures from and we often hung out and painted minis while obsessing over all things D&D. The guy in the middle is Mike. 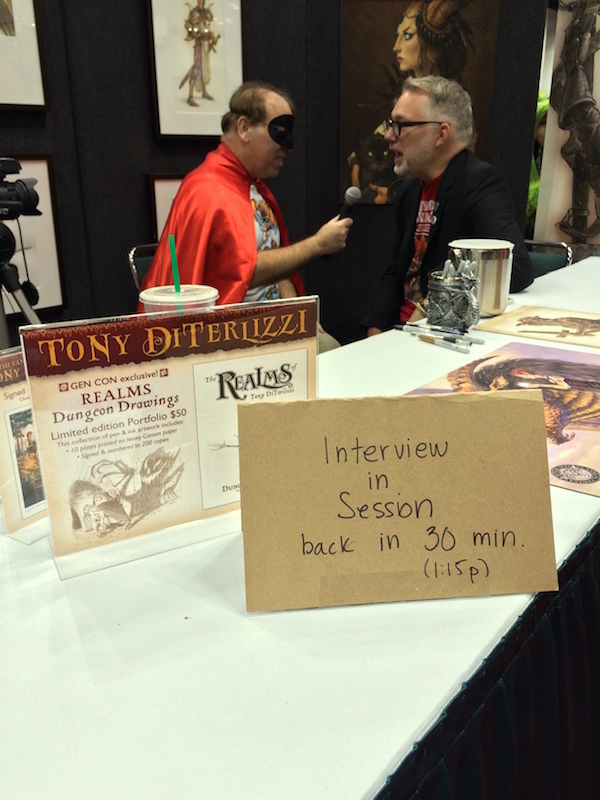 After graduating art school in 1992, he encouraged me back into gaming and to send samples to TSR. 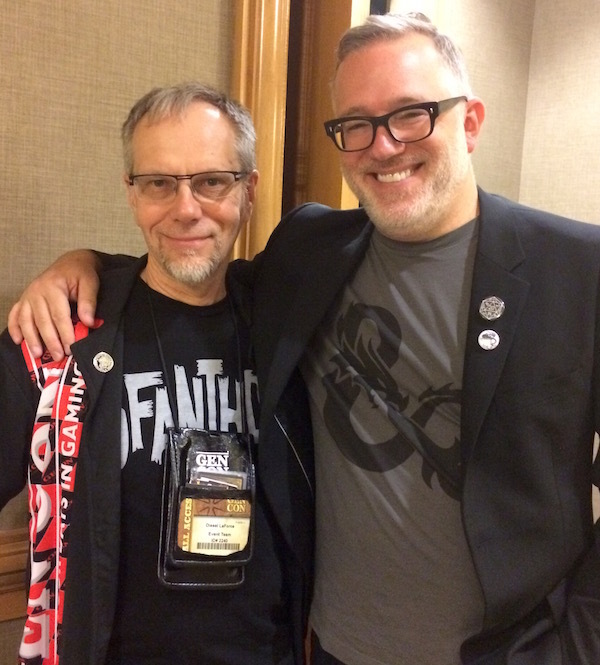 I dedicated REALMS to both of them and was super-psyched to have them join me at Gen Con–for their first time! 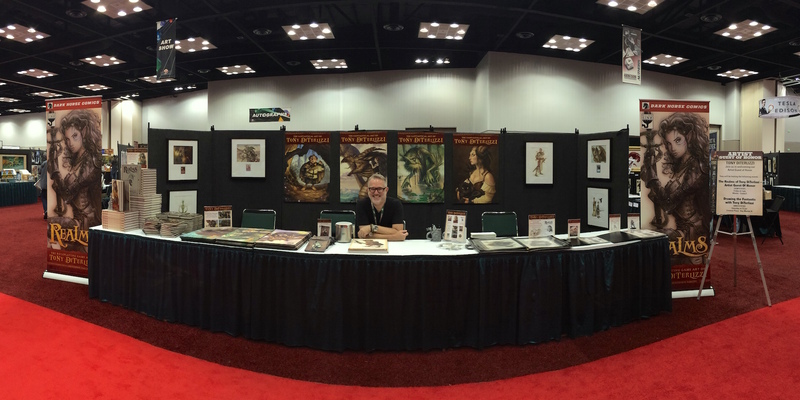 Many thanks to the organizers of Gen Con for having me back and featuring me as Guest of Honor. It was an amazing moment for me, Angela and my friends. For those who traveled far to visit us, I thank you from the bottom of my heart. 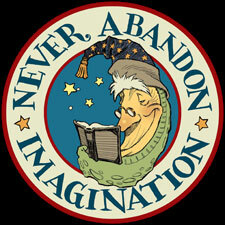 For those who could not attend, we are working on offering some of the overstock at an online store. I’ll post news of it once we sort it out. 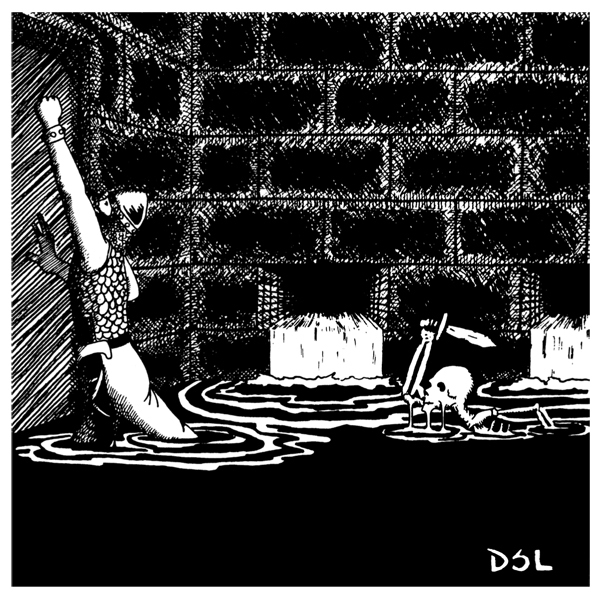 In the meantime, I’m off to another round of Rumble in the Dungeon. 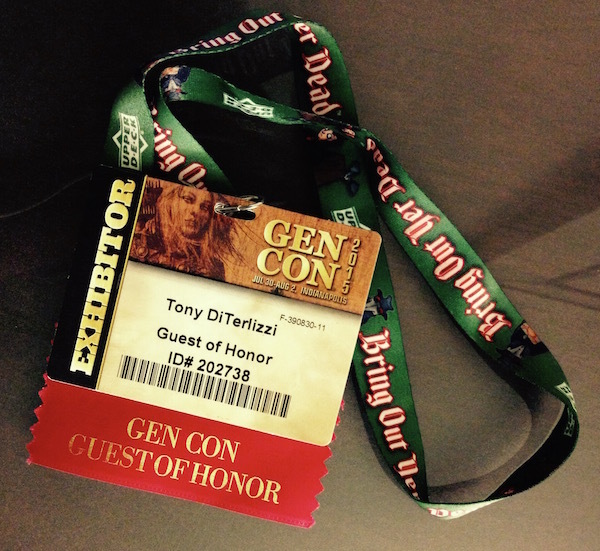 Update 12/1/15: Noble Knight Games is now offering most of the items I had available for purchase at Gen Con. You can check out their store here.